Visagism – what is it? The term Visagism come from the French word visage and means face. The visagiste advice will always remain the heart of a makeover. The purpose of visagism is to correct and harmonize a face by applying the correct makeup considering hair style, clothes style, occasions and personal preferences. A visagiste is a person who is specialised in makeup application but we use this term for any analysis of facial makeover, as well as the analysis of hair and makeup. This course is suitable for inspiring make up artists, personal make up update, make up consultants, beauty therapists. Make Up Atelier courses are specially tailored to your individual needs and each participant will be under close guidance. Students will have access to professional make up brands during the sessions. 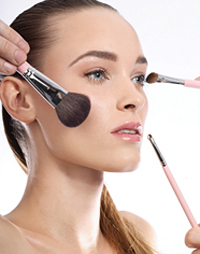 Make Up for mature skin – rejuvenating make up.